Last week Illinois (1-0) put hurt on Kent State, but Wes Lunt's passing yardage wasn't high enough. So this week, the Illini are hosting Western Illinois, a Division I-AA team, to give Lunt a sporting chance at setting some records. To help us preview the game, Scott Holland, whose task as sports editor of the McDonough County Voice (Macomb) is to follow the exploits of this junior varsity team, agreed to answer some very serious questions. We're very thankful to Mr. Holland for taking time to indulge our whims. Smile Politely: I didn’t realize there was life west of Peoria, just corn and Iowa (but I repeat myself). What the hell do you guys do for fun out there? Scott Holland: To be clear, it's not just corn out here, we also have soybeans. A lot of soybeans. As for fun, drinking and playing bags in your front yard continues to be official sport of Macomb and Western Illinois University. Once our eight-month winter begins, that does not change. SP: Which number is higher: U of I’s total points scored in this game or the amount of money the state of Illinois promised to WIU that they have not paid? Holland: I think the state has pretty much screwed everyone over, so Illinois has a lot of damage to do to catch up. SP: In the last 10 years, Western is 0-7 against Big Ten teams. They’ve also only had 3 winning seasons in that time frame, but even Purdue beat them in their best season (8-5 in 2010). I don’t have a question, just pointing out that even a garbage-fire Purdue team beat Western in its best recent season. Holland: Glad Purdue had something to put on the 2010 highlight reel. Maybe when the Boilermakers start playing football again they can revisit what was probably one of the bigger wins for the program this century. SP: The MVFC is arguably the best FCS conference in the nation, so why does WIU stick around as their whipping boy instead of dropping to Division II? Holland: Being in the MVFC is like being the big fish in the small pond. Would you rather play the best teams in the FCS, or go somewhere like the MAC or Sun Belt and play lesser foes but have a shot to go to a bowl game? Going FBS is not an option for WIU but neither is Division II or any lesser division. Besides, every football conference has an Indiana, the goal is just not to be Indiana as long as Indiana has been Indiana. SP: ESPN only has statistics for the Leathernecks’ kicker for 2014, was everyone else really that unremarkable? Holland: That's not that shocking. The punter/kicker was named team co-MVP after the 2012 season but, of course, he transferred to Nebraska the next season. (Side note: he was pulled over in Nebraska on his way to his recruiting visit. The trooper asked him what he was doing and he told the cop he was going to Lincoln because he was thinking of transferring there to be the kicker. The cop let him off with a warning.) Anyway, former San Diego Charger punter Mike Scifres went to WIU, so yes, Western Illinois has a storied history with kickers. While some schools claim to be Linebacker U, or any other glamorous position university, WIU is the FCS's Kicker U.
SP: The best running back still on the roster (Devon Moore) had a long run of just 23 yards last season: did WIU steal the Illinois playbook and build an offense that rushes for 1 or 2 yards on first and second down then throw an incomplete pass on each possession? 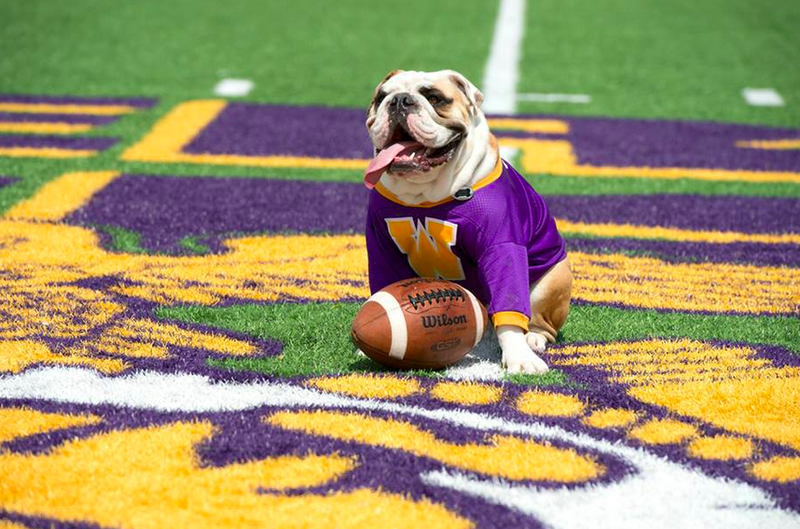 Holland: To be fair, WIU graduated a 1000-yard rusher who had the bulk of the team's carries last year. WIU runs all shot gun, so just getting back to the line of scrimmage is already a six-yard run, so yardage should be weighted. SP: Jack Benventi was offered by Illinois and even committed to Iowa at one point in his high school career, now he’s the backup at WIU. Did he commit to Western as an Iowa sleeper cell to help them win this game as part of the larger war against Tim Beckman? Holland: Tim Beckman did not need any outside help losing games. Quarterback, and really offense, should be a strength of Western this year, as long as no one gets hurt, because no one ever gets hurt playing football. And if you do get hurt, Tim Beckman will make you play through it. SP: There was a receiver on the roster last year named “Hi-C” Scott. I assume he got drafted by the XFL, so who does coach Bob Nielson have to step up at receiver this year, Tang Smith? Holland: I really wish they could have recruited a guy named Great Bluedini or Ecto Cooler, but unfortunately those people do not exist. As far as actual players on the team, Lance Lenoir Jr. set records for catches and yards last year and is joined by returning No. 2 Joey Borselino at wideout. Western has a ton of depth at receiver, so they may just throw the ball all over the field this year. They may have to because the defense has a lot of untested players. SP: “Leatherneck” is slang for a Marine, but Western uses a dog as its mascot. Does Western hate the troops? Holland: History lesson: WIU is the lone non-military university in the country that is allowed to use a military nickname. In the 1920s, the athletic director and coach of pretty much everything petitioned to use the name to honor the Marines (he was a former Marine). As for the dog, it's a bulldog, who does not love a bulldog? SP: Finally, do you predict anything other than defeat similar to nuclear annihilation for Western in this game? Holland: The crazy thing is, before Beckman's dismissal, I thought WIU had a good shot of keeping this close. I'm not sure if his firing helps or hurts those chances. Illinois and Western Illinois kick-off at Memorial Stadium in Champaign on Saturday at 11 am. The game will be televised on the Big Ten Network. Follow our guest, Scott Holland (@hottscolland81), or Chris Davies (@chris_d_davies) for in-game updates.